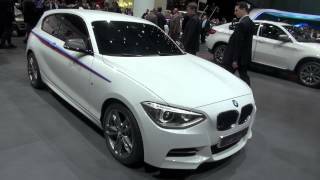 BMW M performance division is unveiling an all-new performance concept - the BMW M135i Concept - at the 2012 Geneva Auto Show. 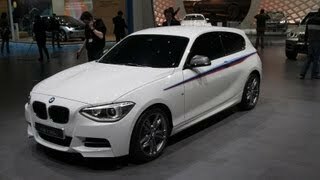 The M135i Concept is a concept study based on the BMW 1 Series featuing a straight 6-cylinder petrol engine. The youthful and sporty looks of the three-door compact body design of the M135i Concept gives a whole new appeal to the car. With decades of racing experience under its belt, the BMW M division has increased the agility, handling performance of the M135i Concept. 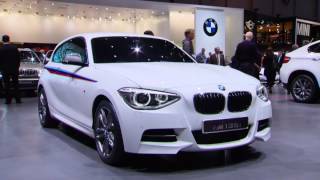 BMW presents the concept study of a BMW M Performance automobile featuring a six-cylinder petrol engine – consistent further development of the new BMW 1 Series’ dynamic characteristics – world premiere at the 2012 Geneva International Motor Show. Munich. Simultaneously with the world premiere of the first BMW M Performance automobiles, BMW’s concept study of a further model from this new product category will be showcased on the media days (6 – 7March 2012) at this year’s Geneva International Motor Show. The BMW Concept M135i consistently utilises the dynamic potential of the new BMW 1 Series for the concept of the first BMW M Performance automobile featuring a straight six-cylinder petrol engine. The body design of the BMW Concept M135i assigns the youthful and sporty looks of the new BMW 1 Series to a three-door compact model, complementing it with the distinctive athleticism so typical of a BMW M Performance automobile. Concept study with characteristics typical of a BMW MPerformance automobile. With its sporty appearance, the compact three-door car authentically conveys the typical qualities of BMW Performance automobiles to yet another vehicle segment. BMW M Performance automobiles offer an ideal symbiosis of outstanding performance and everyday suitability. Using the expertise gained by the BMW M division from decades of motor racing experience, the supreme performance of its tremendously powerful engines specifically designed to suit each model, the meticulously modified suspension technology and the aerodynamic characteristics are all combined into a harmonious overall concept. As a result, BMW M Performance automobiles have noticeably increased agility, precisely controllable handling characteristics and an emotional design. One look at the BMW Concept M135i and the qualities crucial to that characteristic MPerformance feeling are instantly evident. The employment of a straight six-cylinder petrol power plant featuring M Performance Twin Power Turbo technology with a power output of more than 300 hp creates the ideal prerequisites for maximum dynamics in the premium compact segment and, in conjunction with rear-wheel drive concept still unique in this vehicle class, ensures unsurpassed driving pleasure so typical of a BMW. Moreover, the characteristic handling precision of BMW M Performance automobiles is obtained through model-specific suspension technology that includes an M sports braking system and is perfectly adapted to match the supreme road performance. 18-inch Mlight alloys with a double spoke design additionally complement the concept car’s sporting character. Body features typical M athletic design. The front apron of the concept car boasts a typical M design, signalising intensive road-orientation, its large air intakes designed to match the cooling requirement of the powerful engine, ancillary components and large brakes. The three-dimensionally designed flaps on the air intakes give indication of the car’s direct association with motor racing. In addition to intense road-orientation, the specific design of the rear end of the BMW Concept M135i emphasises above all the vehicle’s width. This is supplemented in particular by the three-dimensional modelling of the surfaces and the lower section of the rear apron finished in Dark Shadow metallic. Furthermore, the rear apron accommodates the exhaust system’s double tailpipe that features a dark chrome trim. The BMW Concept M135i’s exterior mirror caps in Ferric Grey and side window surrounds in BMW Individual High Gloss Shadow Line are a further feature of BMW M Performance automobiles. Dynamic, stretched appearance. Concept study of the three-door BMW 1 Series. Compared with the silhouette of the five-door BMW 1 Series, the three-door BMW Concept M135i makes an even more sporting and elegant statement. On the whole, the car has a more dynamic and elongated appearance. Viewed from the side, the car’s athletic, low-slung appearance and its nearness to the road are even more intensely expressed by an entirely horizontal contour line in the area of the doorsills. A dynamically rising character line symbolises the BMW Concept M135i’s urge to move forwards. The wide doors are a further characteristic feature of the BMW Concept M135i’s body design. Together with the rear side windows, the frameless windows form a coherent window surface reaching back to the rear end, accentuating the body’s dynamically stretched appearance. In addition, the surface design in the area of the rear side panels helps above all to emphasise the powerfully flared wheel arches. The visual accentuation of this part of the body directs the eye to the rear wheels, where the power of the six-cylinder power plant is transformed into driving dynamics in typical BMW manner. Attractive prospects for the further development of the BMW 1 Series model range. Thanks to a distinctively sports-oriented appearance, the BMW Concept M135i offers attractive prospects for the further development of the BMW 1 Series model range. At the same time, a clear signal has been given for the expansion of the new product category of BMW M Performance automobiles. The BMW M Performance automobiles being presented at the Geneva Motor Show and shortly to be launched are powered by the world’s most high-performing six-cylinder diesel engine available for series production vehicles. The petrol-fuelled models in this product category will also assume a similar unique position. The pre-series concept car BMW Concept M135i offers a fascinating outlook on a corresponding offer in the premium compact segment. 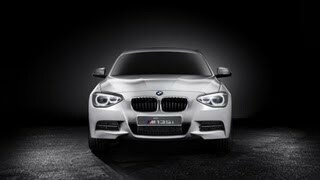 The world premiere of the BMW Concept M135i will take place at the Geneva Motor Show on Tuesday, 6th March at 5 p.m. within the framework of theBMW DTM presentation. On the second media day (Wednesday, 7th March), the vehicle will be showcased all day at the BMW stand.